First select event method > app center. To do this, click the create button. Now you can assign a name to your event, specify the date and location and add a description or a link. Click on save to add the event to your app. Under event history you can view the events created at any time. You can use an existing Google Calendar or create a new one. In the left column under My Calendars you can set a new calendar by clicking on the arrow and selecting the Create New Calendar command. The calendar must be set to public. This can be done by clicking the arrow to the right of the calendar name and then clicking Share this calendar. In the next screen, select the Make this calendar public checkbox. If you need further help, please click here. enter the calendar ID in the dashboard. The calendar ID can be either your e-mail address or – if you have created a new calendar – a specific e-mail address generated for it. Select your desired calendar and click on the arrow in the left column. Under Calendar Settings you will find the section Calendar Address. 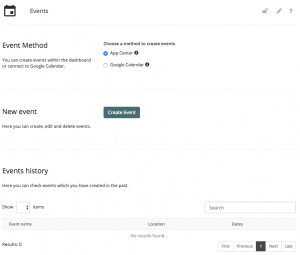 Copy the calendar ID to the events module (on your dashboard) and click save. Make changes to the events in your Google Calendar.